Twenty-two protesters were arrested in front of the State Department office in Chicago. Elijah Zarlin, who worked as a senior e-mail writer at Obama campaign headquarters in 2008, was back in Chicago yesterday—in the First Precinct jail, following a peaceful sit-in in protest of the Keystone XL pipeline. Twenty-two people were detained in front of the Metcalfe Federal Building, where the State Department keeps an office. Protesters ranged in age from a high school student to a grandfather. Many wore T-shirts that read, “If Congress won’t act soon to protect future generations, I will,” a pledge on climate change that Obama made during this year’s State of the Union address. The administration will make a decision on the pipeline in the next few months, pending completion of a State Department environmental review. A draft released earlier this year, which the EPA criticized as “insufficient,” found no compelling reason to reject the pipeline. Fear that the State Department findings will grease the skids for approval is creating a rift between Organizing for Action, the former campaign army now tasked with promoting the president’s agenda, and other activists and donors who are frustrated with the administration’s reticence not only on Keystone but also on a range of climate change actions. The global warming campaign unveiled by OFA in May skirted the president’s timid record on climate by asking supporters to call out climate change deniers in Congress via social media. It isn’t clear to serious activists how tweeting at John Boehner to “stop denying the science of climate change” will have an impact if the people who already acknowledge the real and immediate danger of greenhouse gas emissions, like President Obama, won’t act themselves. “Given that it’s unlikely that the majority is going to change in Congress, and certainly that no action is going to be taken by this Congress on climate, it’s really the president who needs to show leadership,” said Zarlin. Along with rejecting Keystone XL, there are several options for addressing the causes of climate change that do not require congressional approval, particularly capping emissions from power plants, which are the largest source of greenhouse gas emissions in the country. But in April the EPA announced that it was putting a decision to regulate new generating stations on hold indefinitely. According to The New York Times, EPA officials said the rule “would be rewritten to address the concerns raised by the industry.” The delay effectively rules out the possibility that a separate decision to regulate existing plants more strictly will go forward in the near future. 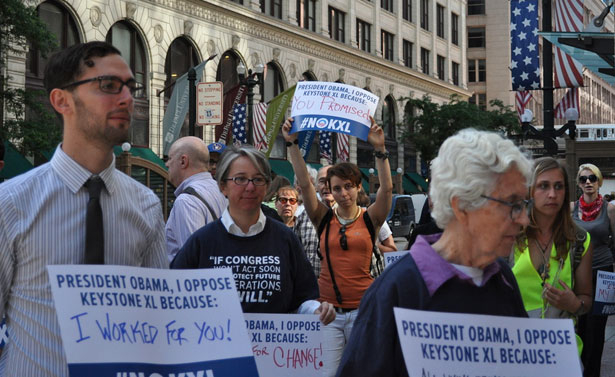 While the administration dithers, the grassroots climate movement is gaining momentum, with Keystone as the touchstone. “This decision more than any other will signal your direction, your commitment, your resolve,” a group of heavy-hitting donors wrote to the president last month. “It is the biggest, most explicit statement you will make in this historic moment, the moment when America turns from denial to solutions.” More than 62,000 have committed to engaging in civil disobedience should Obama approve the pipeline. Yesterday’s sit-in, organized by CREDO, Rainforest Action Network and the Other 98%, was just one of the many demonstrations that have been planned for the summer. Protesters are taking to the streets in Brazil. Read Dave Zirin’s analysis here.